Old folks would often use the expression “Nung bata pa si Sabel” when describing something or a practice that has been in existence a long time ago. Don Luis Araneta used to say that the expression referred to Queen Isabel II of Spain. 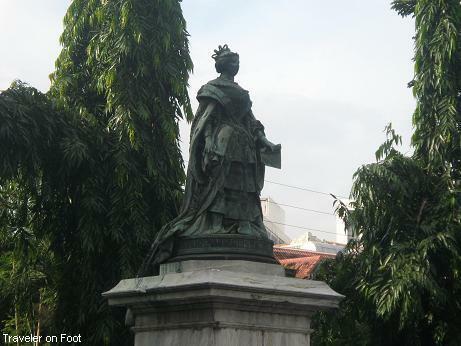 The queen’s profile appeared in 1860 coins and her bronze matronly statue was first erected near the foot of Puente de Epaña (now Jones Bridge) on what is now Liwasang Bonifacio. When the Queen Isabel II was deposed during the anti-Bourbon revolution 1868, the Carlist Spanish governor-general, Carlos de la Torre, had the statue removed to a storeroom in the Ayuntamiento in Intramuros. In 1896, the monument was restored in front of the Church of Malate until a typhoon toppled it down in 1970. 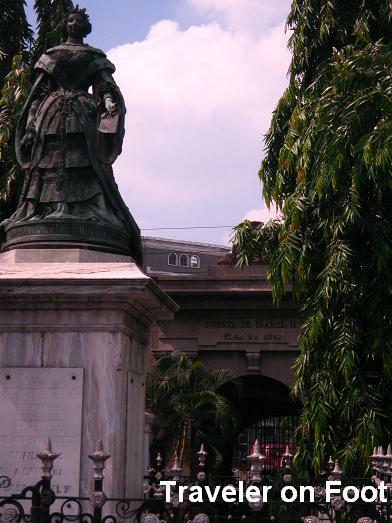 The statue was returned close to its original location in the 1970s near Colegio de San Juan de Letran where it stood up this day across Puerta de Isabel II, the gate named after her in time for viewing by her great great-grandson Prince Carlos (later became King Carlos), during his state visit to the Philippines in 1975. Standing majestically along Magallanes Drive in Intramuros, in front of the gate that bears its name is the statue of Queen Isabel II. The statue of the Bourbon queen was created to perpetuate her memory in a colony half way around the world. Nothing was fascinating about this queen’s monument until I’ve learned the story about the statue’s amazing journey around Manila. Queen Isabel II ordered a Spanish sculptor Ponciano Ponzano to cast a bronze statue of her image in a traje official with one hand holding a symbolic key and the other a dagger by her chest. The finished statue that was shipped to Manila was slightly different from what the queen has ordered. The image shows the queens gloved right hand held a handkerchief and scepter, while the left held a piece of paper with a text dated 1854 (as how it is shown today). According to Ambeth Ocampo, Because no Spanish monarch had ever set foot on the islands, indios and Filipinos alike where kept entranced by the magic of royalty through elaborate celebrations held in Manila every year for birthdays of the king and queen of Spain; their daughters (the infantas); the crown prince (principe de Asturias); and assorted titled relatives. A whole fiesta was declared to welcome the portrait of the king and the queen’s statue. Upon its arrival, people vied for the honor of carrying her on their shoulders to the spot where she was to stand. Ocampo narrated the scene during the morning of July 14, 1860 when the Ayuntamiento filed out of their building in Intramuros and crossed the plaza to the Palacio Real to fetch the Governor-General who presided over the festivities. Protocol reserved for the queen was observed since he represented her in the islands. The procession then collected the archbishop of Manila who celebrated a thanksgiving mass in an open air altar near the covered statue. After the mass, military, religious, and secular officials gathered at the Plaza de Arroceros (now Lawton or Liwasang Bonifacio) and watched as the governor pulled a cord to unveil the statue into public view. Three vivas were followed by full military honors. In the evening, music filled the Plaza Real in Intramuros where a public ball was held to end the festivities. The whole affair cost the government a total of 3,000 pesos: 1,800 pesos went to the ball alone, 800 pesos for the decorations, and 100 pesos as a prize for the best photograph of the event. Unfortunately, Queen Isabel’s unscrupulous and wayward interference in politics led to her deposed in the Carlist, anti-Bourbon revolution of 1868. She went into exile in Paris, abdicating on favor of her son Alfonso XII in 1870. The events in Spain made a delayed yet corresponding change in Manila when Liberal and Carlist Governor-General Carlos Ma. dela Torre shocked Manila society by openly befriending insulars and mestizos, most prominent of these being Fr. Jose Burgos. According to Ocampo, one of de la Torre’s first act upon assuming office was to have the statue of Isabel II removed and dumped in a bodega. Chinese laborers had to be hired to do the job because royalist Filipinos were unwilling to take the statue down. Due to the fear that the statue would be melted down and the bronze used for other purposes, the Sociedad Economica de Amigos de Pais requested the governor for the statue as a work of art. However, it was ruled that, although the government did not spend for the statue, it could not hand it over since it was funded by public subscription. Isabel’s statue was stored in an Ayuntamiento bodega. When the anti-Bourbon feeling began to subside, the statue was brought out to stand this time in front of Malate church in 1896. The Isabel statue stood there until typhoon Yoling blew her down in 1970. In 1975, the statue was restored and was erected on its present site in front of the Intramuros gate that bears her name –Puerta Isabel II. Queen Isabel’s great great grandson, Prince Juan Carlos de Bourbon, now king of Spain, attended the event during a state visit.